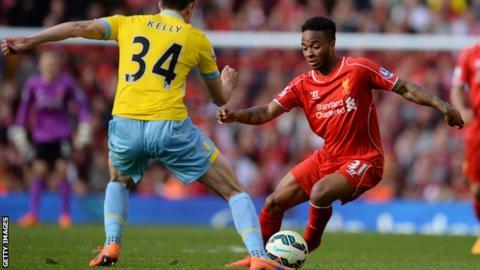 Raheem Sterling has "not achieved anything" and should stay at Liverpool, says former Reds winger John Barnes. Sterling, 20, has rejected a £100,000-a-week contract and is expected to tell manager Brendan Rodgers he wants to leave Anfield in the summer. Manchester City have been linked with the England winger, but Barnes says he would "not become a regular for them". "Raheem has great potential, but Liverpool gave him an opportunity and he should stay," said Barnes. "Does anyone believe that if he goes to Manchester City he will be the first name on the teamsheet or are they just signing him because they need English players?" Football Association chairman Greg Dyke is targeting an increase in the number of homegrown English players required to be in a Premier League club's squad, from eight to 12. He also wants visa requirements to be tightened to lessen the number of foreign players in the English top flight. Barnes, who made 407 appearances for Liverpool and scored 108 goals for the club between 1987 and 1997, said there were other examples of English players whose careers had not progressed at City. "We have seen it with players in the past like Scott Sinclair," he added. Midfielder Sinclair, 26, joined City in 2012 from Swansea, but his first-team opportunities were limited and he was sent out on loan to West Brom in 2013 and then Aston Villa in January this year. He signed a four-year deal on Tuesday to make his loan move to Villa permanent. Sterling, whose current contract is worth £35,000 a week, said in a BBC interview in April that he "talks about winning trophies" rather than money. His deal ends in 2017 and last month he confirmed he had turned down the offer of a new contract. Rodgers, Sterling and Liverpool chief executive Ian Ayre are scheduled to hold a meeting on Friday. "Liverpool owner John W Henry will not be bounced into a sale, bullied by requests to leave or held to ransom by Sterling and his representative Aidy Ward. Nor should he be." Speaking on BBC Radio 5 live, Barnes added: "The time is not right for Raheem to move, but if he wants to move the club should sell him. The manager cannot keep an unhappy player. "This idea of leaving one huge club to join another huge club does not sit well with me, but it is a modern era where the power is in the players' hands." Fellow former Liverpool player and BBC Sport pundit Mark Lawrenson described the contract stand-off as "absolutely everything wrong with football at the moment with these young players". Lawrenson told BBC Radio 5 live: "It is a very, very strange situation. This is a lad who needs to stay at the club for at least two more years to improve every facet of his game." Former Liverpool defender Jamie Carragher, who played 737 times for the Reds, has expressed his anger at Sterling's actions. "For a 20-year-old kid to be taking on Liverpool Football Club over a contract - to the pit of my stomach that just winds me up, it angers me," said Carragher on Sky Sports. "If it's about trophies, Liverpool had a chance for a trophy this year - in the FA Cup semi-final at Wembley against Aston Villa. Where was Sterling? "To do what he's done now, there's nothing worse than that. You keep your mouth shut - get on with playing football."